A Story About Death That Won’t Make You Cringe?! YES. And It’s Beautiful! We say “till death do us part” as a vow, but in the case of Jeanette and Alexander Toczo, they didn’t get to be apart for long. This is the story about death, but watching it you can’t help but feel the intense love these two felt for each other. For 75 years these two adored each other, their hearts beating together as one and as the fate would have it, they stopped beating together as well. 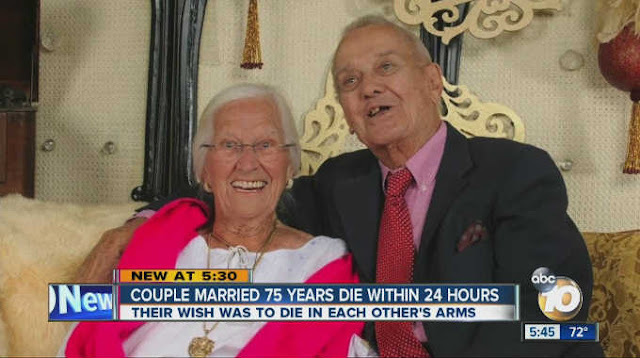 On the day of their 75th anniversary, Jeanette was holding her beloved man in her arms when he took his last breath just like they always wanted, and less than 24 hours later, they met at the pearly gates.